Now in their 20th year, the Awards are distinguished by a proud heritage of innovation and achievement. The Awards promote and encourage outstanding timber design. The Australian Timber Design Awards are open to builders, designers, architects, engineers and landscapers: to anyone involved in the design or building of structures that feature timber. A Rising Star Award is available to students and entrants aged 35 or under. Winning an accolade in the Australian Timber Design Awards, which is an independent and expert appraisal for timber design contributes to personal, business reputation and brand image. Taking part in the Australian Timber Design Awards & Competition provides valuable feedback and experience. Award winners can proudly display their exclusive award trophies and design excellence certificates which grants them prestige and expert status. The Awards competition provides extensive and intense publicity to award winning designs, it is considered as a quality and high-return alternative to any advertising you might be running provided that if you have a good design that could win the any of the Award categories accolade. 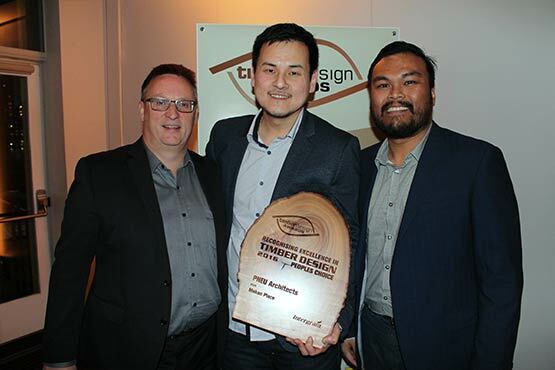 The Australian Timber Design Awards benefits businesses that produce outstanding timber based designs for buildings and structures to achieve their goals, increase sales and get publicity, such as the award badge which provides a competitive advantage to help individuals and companies promote their good design practises and build their brand. The Awards are Proudly Supported by the Following Organisations and Companies. The main organiser is always open to new applications (subject to availability) by interested parties wanting to get involved into sponsoring of the competition or an Award category. Several levels of sponsorship are available to participate in the forming of the Australian Timber Design Awards community. 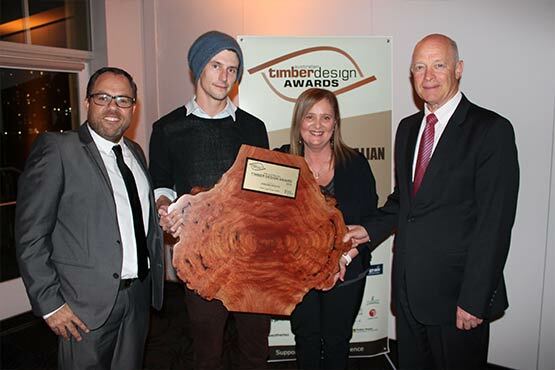 Find out about getting involved as an Australian Timber Design Awards sponsor. 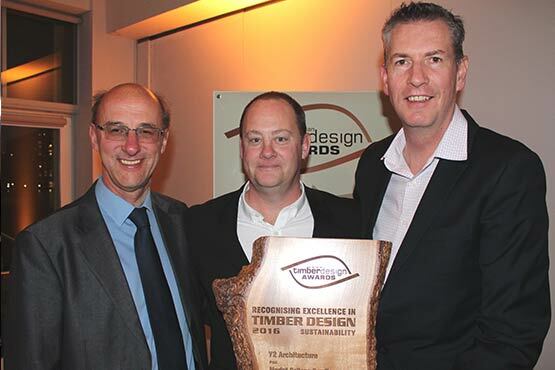 Mr Matt Dwyer and Mr Garry Thompson of Y2 Architecture at the 17th Awards Presentation Night being presented the Sustainability Award by Mr Paul Klymenko - CEO of Make it Wood. James Treble – MC, David Parsons of JAWSARCHITECTS (receiving the Grand-Prix Award), Eileen Newbury, Marketing and Communications Manager for FWPA, John Simon–Chairman for FWPA, at the 17th Awards Night. The mission of the Australian Timber Design Awards is to provide a fair, ethical and competitive platform for businesses, designers and entrepreneurs involved in the building environment design field with different experience levels, diverse professional disciplines and a timber design focus to compete on, while providing them a national (if not international) audience to showcase their success and talents to. The Australian Timber Design Awards and Competition aims to act as blender; to bring together architects, designers, builders, engineers, students, businesses and the press. 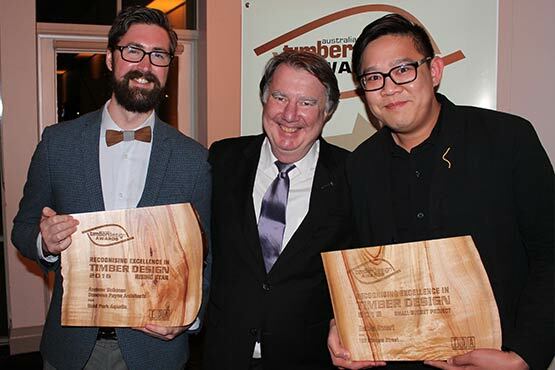 The vision of the Australian Timber Design Awards is to highlight, advertise, advocate, and develop a timber design ethos through the encouragement and showcasing of superlative timber design in a variety of applications. A broad range of entry categories demonstrates the diversity of timber and permits recognition of achievement in a variety of areas. Mr David Higham - General Manager at Intergrain, presenting the People's Choice Award to Nelson Lee - Managing Director and Arfann Ali - Project Architect at PNEU Architects at the 17th Awards Night. The Australian Timber Design Awards and Competition offers a unique system for build environment professionals and students to showcase their outstanding application of timber based design in their built projects The Awards also provides an online showcase system for competition participants. Winners are featured permanently on the Australian Timber Design website. Nonetheless whether you win or not, you will be acknowledged either as a runner up with the winners’ feature or listed as a participant in the yearly Awards eBook. The Awards website will display your project’s summary profile, create an online photo gallery of your entry, and acknowledge your Award accolade. Mr Andrew Volkman of Donovan Payne Architects and Mr Johan Hermijantoat of Bates Smart at the 17th Awards Presentation Night being presented their respective awards (Rising Star and Small Budget Projects) by Mr Paul Michael - Chair of TDA. The competition winner's results are always communicated to the participants at the end of the judging round to allow for publicity and events preparations. All other communication about who has won an award is kept under seal until the Awards Presentation Night event. After which time, a broadcast announcement of the Grand-Prix, People’s Choice, and Category Award winners is made through various channels. The winning projects will be featured on our website as part of a yearly competition gallery. 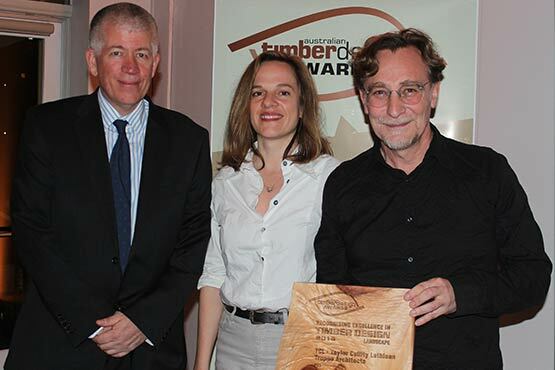 The Awards winners can use their Australian Timber Design Awards badges to further underline that their designs have been evaluated by an industry recognised organisation and that their projects have been marked as great timber designs. Mr Andrew Dunn from TDA presenting the Landscape Award to Ms Caroline Comino and Mr Greg Norman of Taylor Cullity Lethlean and Troppo Architects at the 17th Awards Presentation Night. The Australian Timber Design Awards are organised by the Timber Development Association (TDA) in partnership with Forest and Wood Products Australia (FWPA) and WoodSolutions. The Australian Timber Design Awards is a predominantly national competition to promote and encourage outstanding timber design in the built environment professions.